Magic Pro as a company is unknown in North America but they're apparently quite strong in Asia where price is the most important factor. Magic Pro doesn't actually have their own manufacturing plants rather they buy motherboards from other manufacturers and relabel them. Retailing for $155 CDN ($115 US) the Magic-Pro K7N-Ultra S is not the cheapest motherboard of the bunch but it does come with some nice goodies. The motherboard natively supports 5.1 audio, 10/100 LAN, Serial ATA/Serial ATA RAID and even has an extra Ultra 133 IDE channel for good measures. The motherboard still has five PCI slots so there's lots of room for expansion. The layout of the board in general is pretty good although the floppy drive connector is a bit low for our tastes. The board has a clear area around the socket, but unfortunately the four surrounding mounting holes have been removed so people with the more powerful heatsinks like the Swiftech MCX462 or Alpha PAL8045 are out of luck. We were pleasantly surprised at how well the K7N-Ultra S performed in all test. It was also a pretty good overclocker but that's expected with a C1 based nForce2 Northbridge. We were a bit surprised to see the K7N-Ultra S had no brackets included with the motherboard especially only having two USB ports on the back of the motherboard. 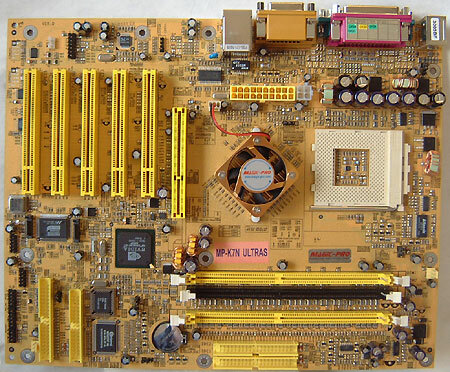 The Magic-Pro K7N-Ultra S is a well rounded motherboard but unfortunately it's not really able to differentiate itself from the rest of the nForce2 pack. The same cannot be said for ABit, the overclockers best friend, and the NF7-M is up next.